Friday morning…. What a Friday morning! Sunrise just hinting about the upcoming absolutely unbelievable San Diego day about to emerge. I jumped on my bike and routed myself down Cardiff’s PCH… the view was stunning. La Jolla looked like it was just a mile away… the Coronados were clear on the horizon, and ocean was glassy. 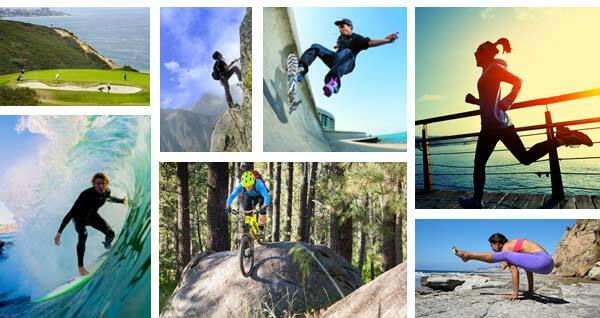 Let’s see, in no particular order and without much thought I could… mountain bike, street ride or cruise the sand. Or beach walk, walk the stairs, fly the Torrey cliffs, birdwatch, stand up paddle or surf or both… swim, snorkel, chase lobster, sail, row, or skydive. I could skate in a park or the new Olympic training ground, or down the street, or walk my neighborhood. I could play golf or executive golf or fly a kite or drone, or maybe go for a sail. I could go for a hike around the lagoon, or the desert or about anywhere in between. Or maybe a yoga session or a visit to the Swami’s park to meet and greet our street drummers, or how about heading to Borrego and try to spot some goats or sheep, or check out the foliage? We could ride our dirt bikes or cruise the amazing mountain roads. Or maybe get in a old guys’ hoops game at the Y… or maybe a little pick-up soccer at the park... or play a little tennis and our really good local courts? Or maybe, just chill and think about what a great place San Diego is to live. Does an NFL franchise define a great city? Not for me, and a couple of million other San Diegans happily making a healthy and active life here in America’s Finest City! Apparel News surveyed a number of key market indicators - including SDSI member, Kevin Sullivan - about how the industry is being affected by the Chinese tariffs. Kevin says it is still early in the negotiation process but, “we are beginning to see companies who have a large sourcing presence in Mexico and other Central American countries see an uptick in business. In a global economy, retailers will continue to have the option of shifting to vendors with alternative supply chains, but there is little doubt that China remains a very large percentage of current apparel production.” Read the full article and scroll down to the ninth picture to see Kevin’s thoughts. In case you missed the Slyde Handboards update this month on SharkTank, they put together a recap with some video snippets from investors Mark Cuban and Ashton Kutcher on their blog. While you’re there, check out the latest collab between Slyde & DaFin. Steve Watts talks about how the limited edition fin came about as well as its design inspiration... Of course, there's an option to preorder so you'll have the coolest fins in the lineup! Hylete adds a key member to their leadership team as they continue to track towards the goal of going public with the addition of CFO Joseph Johnson. Coming from prAna, Johnson said, “I am very excited to join the HYLETE team, HYLETE has a laser focus on developing a superior product and a great track record of creating passionate ‘investomers’. They have probably become one of most prolific crowdfunded companies, raising over $8 million from 3,800 investors to date.” Read the full press release. NiteRider Presents: Do We Really Need Bike Lights During the Day? SDSI Sponsor and Executive Board Member TurningPoint Executive Search launches new Talent Portals to serve SDSI members and contacts. "We have been looking for a cost effective, targeted solution that would allow small and upstart businesses to tap into our extensive talent pool of sales, marketing and operational professionals" says Ken Schmitt, CEO & Founder of TurningPoint. "These new Talent Portals will give SDSI members access to our pre-screened, elite candidates without incurring any upfront costs". Please contact Ken for more information at kens@turningpointexecsearch.com. The Sun Diego Am Slam was another huge success with over $8,000 dollars in prize money earned by local athletes! The final surf event featured over 200 competitors and came down to the wire in many divisions. There is a video recap of the skate event on youtube ​​​​​​and you can see the recaps/results for surf and skate including photo albums. The always successful Women’s Day will be back again this year featuring Jessica Mendoza, ESPN MLB Analyst and two-time Olympic Medalist; Courtney Conlogue, Professional Surfer and 2018 Vans US Open of Surfing Champion; and Sophie Goldschmidt, CEO of World Surf League. Get your seat or table now – if you wait too long, it will sell out. Cathy Gonzales was named Managing Partner of the San Diego office on Monday Oct. 23rd. Gonzales will oversee nearly 270 KPMG employees and partners in San Diego succeeding Beth Altman. Gonzales has been with KPMG since 1996 and transferred to San Diego in 2000. Visit SDBJ for the full press release announcement. Once again, the YMCA partnered with CAF to bring out over 70 spin bikes to the La Jolla Cove during the marquee CAF event, San Diego Triathlon Challenge. Thanks to the YMCA’s vendor connections, riders were able to break in some brand new spin bikes while participating in the 90’s dance party theme. Most athletes took part in one of the three 1.5 hour sessions but a bold few were in the saddle from 9:00 AM to 1:30 PM in an effort to raise money for the Challenged Athletes Foundation. For a recap of the entire event, take a look at the Union Tribune article – and don’t forget about the photo gallery, there is never a shortage of inspiration at this event. Speaking of inclusive events, you may recall that the Winter Dew Tour expanded recently to include an adaptive athlete event/class. This year they are carrying that forward starting Thursday, December 13th in Colorado. Other events include Men’s and Women’s: slopestyle, streetstyle, team challenges, modified superpipe, and others. View the full schedule. The CEO of Rockport, Gregg Ribatt said, “Reef is a powerful brand with deep authenticity and an incredibly loyal customer base. We are excited to work with the strong leadership team that has been guiding Reef through its brand evolution and resurgence. We believe in the team’s growth plans across consumer, product and geographic expansion.” Read the full press release on Shop-Eat-Surf. What works on everything from WSL Surfers and Nitro Circus Athletes all the way down to diaper rash on babies? Easy, BLDG Active Skin Repair! For the scientists in the community, the WSL Doctor says, “This then causes the body to first activate an inflammatory response that leads to the second phase of cell proliferation and the healing process and ends with repair to the damaged cells and tissue including active scar remodeling.” which translates to "it makes you feel better” Read the full editorial. ElliptiGO pulls off the trifecta on the Bicycling.com’s article titled “Take Your Low Impact Workout Outside With an Elliptical Bike” with the 3C coming in third, the Arc coming in second and the new Stand Up Bike taking the top spot. While we are talking ElliptiGO’s, we have to give a shout out to the 9th annual ElliptiGO Rally Weekend which took place in San Diego last weekend bringing together 100 enthusiasts. The event culminated with the Elliptical Cycling World Championships. Read more about the event here. SDSI Accelerator Graduate RevTek Roller participated in SDAC's Pitch Deconstruction event this month. Of the 25 entrepreneurs who made their 1-minute presentations, Founder Roth Weinstein tied for most votes! He was invited back to make his 3-minute presentation and participate in a deep dive and constructive feedback on the presentation. Roth was touted with great stage presence, a tight pitch with very clearly communicated points. “Considering where I was at during the accelerator program, this is a huge improvement and I have SDSI to thank,” says Roth. One of our members informed us that one of their overseas factories had their identity stolen and it nearly cost this SDSI company over $250,000. The San Diego company was directed with new wiring instructions which were completed. Three hours after the wire was approved, one of the executives noticed an inconsistency which flagged the issue. In working with the bank and FBI, the company was able to recover the funds (which is extremely rare.) If not for the quick action, those funds would have likely been gone forever. We are passing this learning experience along as a warning to any other companies that deal with overseas factories to take extra precaution. What Happens to your Customers, after the sale is made?